This archive’s alive with the sounds of Jewish music. Robert Freedman L’54 likes to joke that he married his wife, Molly, “for a song.” The year was 1956. He had just finished a stint in the Army and was living at home with his mother. She told him there was a party he might like to attend, and that there might be some nice girls there. Freedman went reluctantly, but once there he joined Molly and others in a Yiddish singalong. Six months later, drawn by their shared connection and love of traditional Jewish music, they married. For her dowry, Molly brought seven “well-worn” recordings by Sidor Belarsky, the classically trained Ukranian folk singer. “It was a total put-up job,” Freedman says wryly. Molly rolls her eyes. “He knew a lot of words, but he couldn’t carry a tune,” she cracks. The couple is sitting in a glass-walled room of the Kislak Center for Special Collections, Rare Books and Manuscripts in Van Pelt Library, home to the Robert and Molly Freedman Jewish Sound Archive. 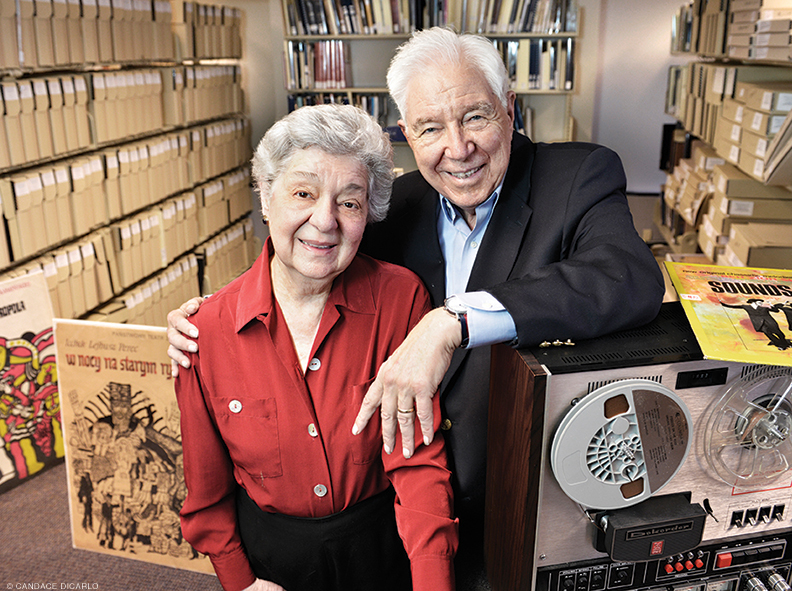 That assemblage features some 6,000 Judaic-language recordings, including songs of the diaspora, folk and religious works, Tin Pan Alley tunes, spoken-word pieces, and instrumentals such as klezmer music—as well as books, sheet music, and ephemera, all collected by the couple over the past six decades. The focus is less on rarity than on inclusiveness—there might be 150 versions of Hava Nagila, or a lone record from a local artist that went nowhere. Some semi-household names do show up, such as Theodore Bikel, who originated the role of Captain von Trapp in The Sound of Music and famously kvetched as Tevye in Fiddler on the Roof, logging more performances in that role than any other actor. And plenty of people find occasion to use the collection. “In terms of recorded music and film, it’s invaluable,” says Andrew Cassel, a former Philadelphia Inquirer reporter who wrote about the couple for the newspaper back in 1992 and has since reacquainted himself with them as he pursues his master’s in the College of Liberal & Professional Studies. The collection is an “important and relevant one for understanding Jewish history,” he observes, noting that he had recently visited the space to view the 1932film The Return of Nathan Becker—the only Yiddish talkie ever produced in Soviet Russia—as part of his Russian History in Film course. Inquiries roll in from around the world. “Being at the University gives us a global presence,” says Freedman. The Freedmans trace their adventures in collecting back to the early 1960s when Molly, bored and stuck at home with two toddlers while Bob began his career as a lawyer, suggested he buy her a “couple of records—the oldies but goodies.” The modest request sparked an obsession. As he crisscrossed the country on business, Bob picked up LPs wherever he went. Later, when the kids grew older and the whole family traveled, they hunted for, and found, Yiddish, Hebrew, and Ladino (aka Judeo-Spanish) recordings in Buenos Aires, Ireland, Sweden—even in Vatican City. Though he has a hard time choosing his favorites, Bob has no trouble pinpointing the appeal of the music. As the collection grew—“We used to carry our catalogue with us wherever we went to avoid duplication,” Freedman says, “but that soon became impossible”— word got around about its scope, depth, and especially its organization. The meticulous database he created, which cross-references songs by title, first line, performer, composer, and other categories, has lured Penn professors of Jewish studies to the couple’s home in Elkins Park and later Rittenhouse Square, where they combined two apartments to house everything. Twenty years ago, Penn invited the Freedmans to transfer the whole megillah to its Rare Book & Manuscript Library (now the Kislak Center), retaining Bob as curator. Congratulations to the Freedmans, the university, and the author for highlighting this extraordinary gift. Freedman has given a “new lease on life” to Yiddish music. Is the Return of Natnan Becker available somewhere? To Bob Freedman – please forward. Congratulations. Just saw the article in the Gazette, and it brought back fond memories of the ‘cursor reverser”. You and Molly look great. Stay well!